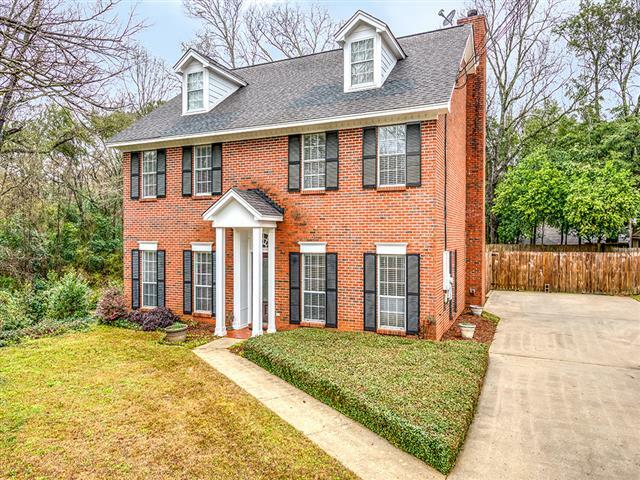 This spacious home is situated on a private lot in the heart of Prattville, convenient to everything. The updates are amazing! It offers crown molding and fresh interior paint throughout, large rooms, great storage space, and so much more. The foyer is flanked by two flexible rooms that could be used as formal living and dining spaces, an office/study, a playroom, or just about anything. They have lovely wood flooring that extends into a huge family room with a wood burning fireplace and large windows overlooking the backyard. The kitchen is gorgeous! It features an abundance of white cabinets with quartz counters and a glass tile backsplash. The appliances, to include a 5 burner smooth top range, have been upgraded over the past couple years. The high grade vinyl plank flooring extends into a sunny breakfast room with space for a large table. An updated half bath and a laundry area with cabinetry are also located on the main level. A door inside the coat closet provides access to an under-the-stairs area that has lighting and could be used for storage or even a hideout during bad weather. A beautiful wooden staircase leads to the 2nd level where 2 linen closets can be found in the hallway. The oversized master bedroom features TWO walk-in closets and a luxurious bathroom. The bath has split vanities with storage, a separate water closet, a linen closet, a shower, and a separate free standing soaker tub. Bedrooms 2 and 3 are both nicely sized and each has two closets. They are serviced by a hall bath with a large vanity. Exterior amenities include a large covered porch, an attached storage room, a detached storage building, a full privacy fence, and an underground sprinkler system. The commute to Maxwell AFB and downtown Montgomery is less than 20 minutes via Hwy 31. The location is central to all Prattville schools with each being only a few minutes away. Shopping and eating establishments are also close. Don’t miss out – call today!